After a peaceful night’s sleep, I woke to an early dawn in the desert scrub, the air filled with the scent of sagebrush and juniper. There were a handful of far-off sounds from vehicular traffic, but for the most part all was quietude with the occasional outburst of song from a passing bird. The stillness invited a contemplation that I enjoyed with my quick breakfast and hot coffee. There were some clouds in the sky, but not enough to obscure the rising sun from painting those same clouds vivid oranges and reds, bringing further cheer to an already sparkling morning. Not wanting to hike during the heat of the day I soon made my way over to the trailhead that would allow me to hike from the campground at the Square Tower Unit of Hovenweep National Monument to first the Holly Unit and then the Horseshoe and Hackberry Unit. From Square Tower to Holly is approximately four miles distance. The trail is challenging only where it descends from the canyon rim soon after departing the trailhead. I had to scramble down rocks and pass through a narrow crack between two large rocks so as to enter into Little Ruin Canyon proper. The canyon isn’t particularly deep, but like so much of the Colorado Plateau the walls are nearly vertical in most places and access from the rim to the bottom or vice-versa is often challenging. The canyon bottom is fairly barren, there being some of the ubiquitous desert scrub brush strewn about as Mother Nature would have it. The trail would sometimes follow the sandy wash, making footing a challenge as walking through sand always takes more effort than a hard pack surface does. After walking downstream along Little Ruin Canyon for about a half a mile, the trial makes a sharp left-hand turn and climbs a tributary, Keeley Canyon. Somewhere before this canyon terminates at the Holly Unit I pass from Utah back into Colorado and as I slowly climbed in elevation the vegetation became a bit more fuller and lush, cottonwoods and other species denoting the presence of water becoming more prominent. In this canyon bottom all is quiet and peaceful. I felt truly isolated from the world at large, with no more responsibility on my shoulders than to pass through this natural setting without creating a trace of my passage beyond my footprints and whatever snapshots I saw fit to take. The sun began to shine early and the canyon caught the warmth, but at this early hour it was pleasant and not oppressive. I soon passed by my first ruin, a mound of undistinguished rubble that seemed to be set off by itself from other ruins. I stopped to observe and wonder, but otherwise soon continued on my way to the Holly Unit. I knew that I was getting close to the Holly Unit when the trail climbed back out of the canyon bottom through another narrow defile and I scrambled back out onto the rim of the canyon, where I had a fine view of the surrounding country side plus long views all the way down to Shiprock and over to Sleeping Ute Mountain. The vegetation on the rim is a bit different, more sagebrush and not any cottonwood here. This is dry, challenging country and the thought crosses my mind, once again, that perhaps this area was a bit lusher when people originally settled the area. Eventually, I spotted the ruins standing on the horizon, their walls of tan stone catching the still early light of the morning. I passed through the fence erected to keep out cattle and made my way to the ruins. Here are numerous structures, including one, the Holly House, that has the original beams used some eight hundred years ago, and another, the Holly Tower, that sits on a large boulder in the canyon and has hand and foot holds chipped from that same boulder upon which it sits. Observing these ruins leaves me with a sense of wonder and awe. These walls, standing without maintenance for hundreds of years, may not be on the same scale as Greek or Roman ruins, but are still a reminder of the human will to endeavor and create. There are no people here besides myself, only the spirits of those who came before, not exactly ghosts but a presence, a presence that suggest thriving life. There are many theories and ideas about the reason or purpose for these structures but in the end regardless of purpose or intent the stonework endures and the mystery becomes almost irrelevant. Now on top of the mesa, out of the canyons and their confining walls, I could see for miles in most directions. The time came for me to move some more, and I walked from the Holly Unit to the Horseshoe and Hackberry Unit not quite a mile away. The pinyon trees remind me that there is plenty of food here for people to eat. The Ancestral Puebloans, hunters and gatherers in addition to gardeners and raisers of livestock, left little behind when they migrated elsewhere after abandoning these structures. The exact reasons remain a mystery, but may be surmised keeping in mind that nothing is definitive. At Horseshoe and Hackberry the ruins sit at the head of Hackberry Canyon, a tributary of Bridge Canyon which is the next drainage east of Little Ruin Canyon. Both these defiles drain into McElmo Creek and eventually south to the San Juan River. 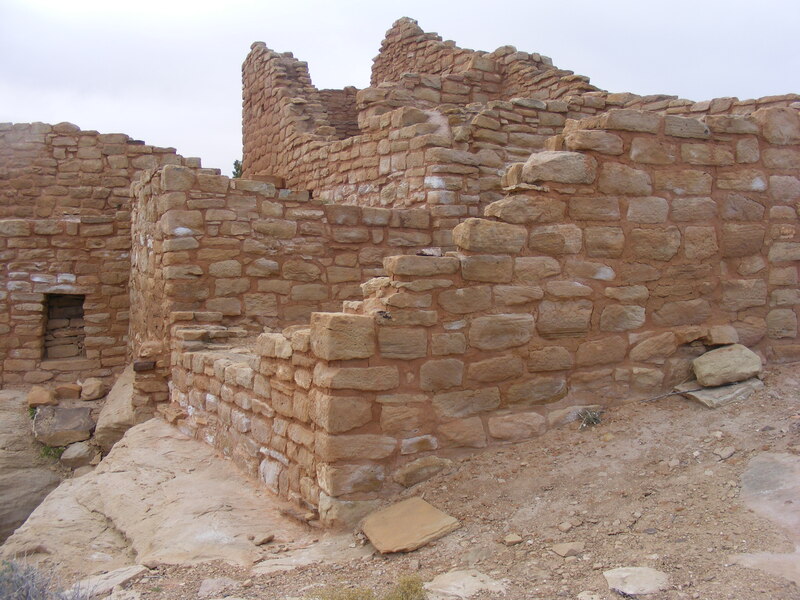 At the Hackberry Group lies what was thought to be the largest village or community of Ancestral Puebloans in the region. The National Park Service literature talks about the mystery of these villages demise, and how the mortar was made from clay, ash and sand. Each of these stones was shaped for fit, but no one is sure if the work was done by specialized masons or the community at large. These mysteries can overwhelm the mind and for the moment I put them all aside and just observe and respect what I can see, namely the numerous structures, walls and heaps of rubble from those centuries past. The views from these groups allow fine observation of the canyon below as well as the surrounding land on the mesas. There seems to be some hint that some of the structures were used for defense, but it isn’t definitive. Human nature being what it is, it doesn’t seem unreasonable that warfare would have existed on some scale, but that is also rather presumptive. Horseshoe, named for the shape of the pattern that the main body of buildings were laid out, and Hackberry are strewn with numerous ruins that create a further sense of wonder and speculation. No other people are here, and I am able to take plenty of time to stare and let my mind wander. The modern barriers are minimal, and allow, in places, a curious person to get a good, close-up look at some of the stone work and general architecture. There are even small diversions that control water for agriculture and the totality of this community boggles my mind. These people, however it is looked at, had at least a modicum of civilization in addition to the culture that all peoples have. I have seen enough here and am ready to make my way back to the campground. I slowly hike back to the Holly Unit and revisit the towers and houses. This sight may not be the most extensive, but what is here is my favorite and appeals to me. I see some other visitors, but the sense of solitude is not disturbed. I revisit my favorite structure, the Holly Tower, and am happy to find that the sun has shifted enough to enhance its features. The way that the Holly House sits above the canyon rim captivates my sense of appropriateness and harmony. I am struck by a sense of the totality of the scene, almost overwhelming. How closely related were these builders to the peoples further south who built such monumental structures? I hike back down Keeley Canyon, passing folks, who presumably got a late start, that were hiking up canyon in the beaming sun. It was warm, and the only sound nearby was the crunch of my shoes on the sand and gravel in the dry wash that the trail follows. The trail isn’t terribly long, four miles or so, just enough to allow me to process all that I saw and let my mind dwell on the meaning, if any, and lessons these ruins have for our modern society. Reaching the campground, I suddenly feel exhausted and tired. No wonder, I began hiking at about eight this morning and it is now afternoon, about three. It has already been a long day of sightseeing and exploration. My tent is inviting in the warm afternoon sun and I am soon horizontally reposed. Most of the next two or three hours are spent either sleeping or reading materials about the ruins or some of the magazines that I brought along for the inevitable moments of quiet time like these. As the evening approached, I began to feel rested. Thus, I took the opportunity to make a hike along the Little Ruin Trail. The Little Ruin Trail has the best preserved sets of ruins and these were further enhanced by the low angle of the light from the setting sun. Easily accessible from the campground and visitor center, there were numerous people out and about, and everyone was fascinated and entranced by the striking ruins sitting on the rim of the canyon as well as those that were in the bottom. So much effort and work were put into these structures long abandoned but still here hundreds of years later. The setting sun inexorably sank further down towards the horizon before finally being eclipsed by the Earth’s curvature. The last golden rays struck the walls of the ruins and added hues and tones seen only at this moment. I walked back to my campsite and made supper as the sky slowly turned darker. Soon the first stars would be out and the night’s chill would encourage an addition of a layer of clothes to what I was already wearing. The fire was warm, though, and the clear sky sparkled with the many jewels of far-off stars and galaxies. To bed, to sleep, to dream were all in my immediate future, but not before I spied a few meteors streaking across the darkness. Coyotes howled nearby, and reminded me that not all is solely human related, that there are other mysteries here and beyond. The night darkened to its deep, dark blue, nearly black, hue and the fire burned through all the fuel, ceasing the yellow light and flickering flame and changing to a steady orange glow emitting heat and comfort. Occasionally, whenever I felt a slight chill, I would stir the coals, sending up a stream of sparks concomitant with the ubiquitous crackling sound, all of which was comforting to my body and soul. Eventually the warmth decreased and the stars lost their power to stave off sleep, and sleep is what I did, and as I prepared to lose consciousness I also eagerly anticipated the next day. About fifteen years ago I first visited Hovenweep National Monument and was never able to completely get the images of the ruins on the vast Colorado Plateau out of my mind. I didn’t take any pictures on that journey, or at least any that I have found. So, this spring I thought that it was time to revisit this special place once again. I put aside two nights for the trip from my home in Gunnison, Colorado, to this remote location. The dogs were kenneled this morning but I had the foresight to pack last night so that, besides caring for the dogs well-being while I was gone, all I had to do was to load up the cooler and head west on U.S. 50 towards Montrose. On the way I stopped at the Cimarron River to observe the changing of the seasons and the flow of water being discharged from the mountains. To get to Hovenweep involved a convoluted succession of highways that culminates with a drive out of Cortez, Colorado, down McElmo Canyon and eventually to the monument itself. Compared to my home, the desert was warm and I was ecstatic to get out of the damp cold for a while. The first thing I did was find a place to camp in the Park Service campground in the Square Tower Unit. This area is renown for its quietude and peacefulness. I found a site that I liked, one that had a view to the east and of Sleeping Ute Mountain. I made camp and once everything was stowed the way I wanted it, I drove out some ten miles to the Cajon Group were a group of ruins are centered around a spring. 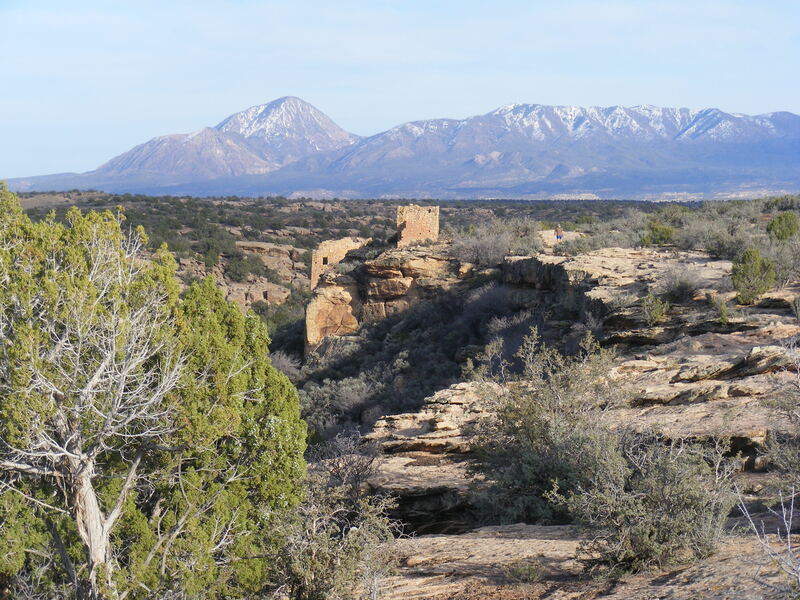 Hovenweep National Monument consists of five separate units. The campground and headquarters are located on the rim of Little Ruin Canyon, and sit atop Cajon Mesa, a large, flat plain mostly of sagebrush. The Cajon Unit is on the rim of the same mesa, but off to the southwest and it overlooks tributaries of Allen Canyon. Regardless, it all flows into the San Juan River to the south and eventually into the Colorado River. The view from the southern rim adjacent to the Cajon Unit stretches out into the Four Corners region and includes Shiprock in New Mexico and mountains in the northeast corner of Arizona, besides Sleeping Ute Mountain and the La Plata Mountains in Colorado and the Abajo and La Sal Mountains in Utah. All of this was in view despite the layer of hazy clouds that had slid in. 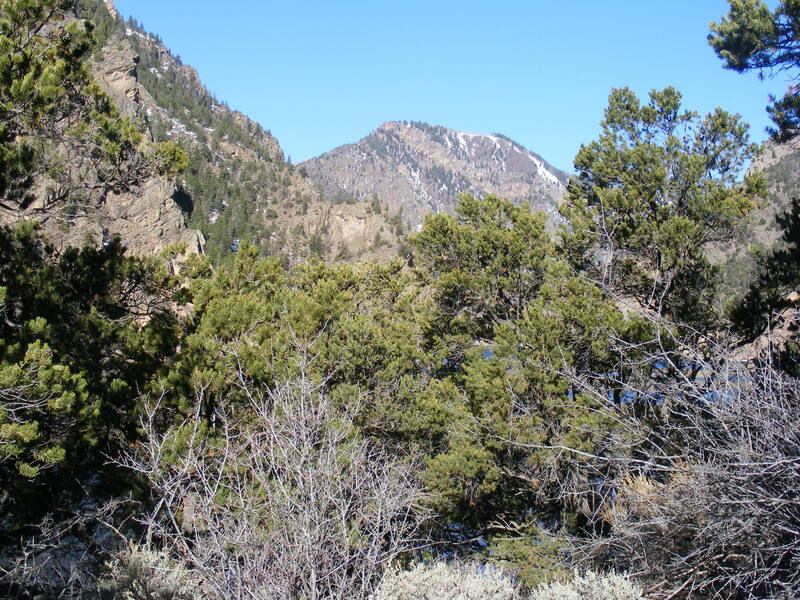 This land is forested by, if not sagebrush, pinon and juniper. Water is scarce, and the spring at the Cajon Unit would have been vital for the past inhabitants’ survival. It has been used fairly recently, at least until the Twentieth Century. I can’t help but wonder what this area would have looked like some eight hundred years ago, if it was more lush and wet, or if it was similar to what is here today. There is evidence of human use that dates back some five thousand years, when the landscape would have been more affected by the last preceding ice age. That, to me, is amazing to think about, what the continent would have looked like at that time. Most of the ruins have tumbled down into heaps of rubble, but enough remain standing to get a good idea of the methods and architecture used by the Ancestral Pueblans to construct their dwellings. There is a certain amount of mystery and conjecture when attempting to deduce any sort of meaning from peoples who did not leave a written record, and I will not attempt to interpret, leaving that to the myriad books and papers that already exist. Regardless, the standing walls are amazing to behold. To think that people lived here with such sophistication is at once startling and awing. The real mystery is why they disappeared and there is much speculation about a devastating drought, depletion of resources and warfare, none of which has been entirely proven. The direct descendants still live in New Mexico, in villages that look similar to what is seen here. Those folks also have an interpretation of what went on here, the “hows” and “whys”. Perhaps they will share what they know and perhaps we will listen. The wind is blowing but it feels good and cool. Earlier it had gotten almost hot when I was in McElmo Canyon. Hot, anyhow, by my standards of living in one of the nation’s coldest cities. I gaze at the ruins and walk with respect for those who were here. If I put my mind to it, I can hear the yelling of children, the sounds of daily life; but these too are conjecture and who knows what the sounds of daily life were. A village, though, would have had sounds and I would hazard to guess that there is a certain universality to them. The sun has begun to set, and it has been a long day. I leave the past behind and drive back out to the campground where I make a fire and grill up some dinner. Dinner happens to be a marinated elk round steak, a sliced onion and a quartered red bell pepper, and a delicious Session Red-Label beer. The sunset shows some color and I am in a place and mood to enjoy it, kicking up my feet while eating supper and drinking beer, enjoying the comfort of a warm fire as a bulwark against the cooling, starry-sky night. A fine way to finish any day, and I am eagerly looking forward to the next. The Hermit’s Rest Trail is located on the north rim of the eastern portion of the Black Canyon of the Gunnison, which is managed as part of the Curecanti National Recreation Area. As such, it is on a strong south face and typically the snow melts out here before more places. As another advantage along those same themes, it also lies at a relatively low elevation. The trail winds down about three miles and descends not quite two thousand feet. This south face is generally warm and dry, so the vegetation is more shrubby than forested. The Black Canyon of the Gunnison is a narrow defile carved from the basement rock of the Rocky Mountains. To get from the rim to the river itself is a challenge regardless of the situation, but this trail is perhaps one of the easiest ways to go about it. The views are sublime when standing at the rim, where the trailhead is located. There are the distant San Juan Mountains to the south and ridge after ridge of tree-topped horizons in every direction, when my gaze isn’t commanded by the canyon itself. On this particular day, the shepherds and I were blessed also with a clear, blue day that allowed all these distant horizons to be seen. The hike is about to commence but some minutes are consumed leaning on a railing, observing and gazing and soaking up the warm sun. If there is a reason I am not a fan of this hike it is because the hike ends at a reservoir that inundates the Gunnison River. I would rather have a free-flowing river at the end of my hike rather than a stagnant, artificial pool. Otherwise the trek down from the rim of the canyon was fun and exciting. Each step brought me further down, unusual as my first steps usually take me up, and the rim above became more and more distant. The pool below seemed distant and far away, but I knew that with scant effort I would reach its shores shortly. I am used to hiking up and then down rather than vice-versa. However, this is no impediment, since I consider the downward trip to be more exacerbating than the upward. This may seem odd to most, but the only real advantage I see on traveling downward is that it is generally quicker. It is also the direction that is more likely to cause injury as gravity will aggravate any mistake that is made. I have been over this trail maybe four or five times before, but it has been many years since I last visited this path. The drive is rather long for a manicured, relatively short hike when there is so much else to see, but I also believe that it is good to revisit familiar places after a long absence. If nothing else, making a manicured, relatively short hike that I am familiar with helps to calibrate my endurance and allows me to assess myself. This early in the year it is very quiet here, there are no other hikers nor any sound from the seldom traveled state highway above. I enjoy the sounds of nature, mostly a breeze rustling leaves or the songs of small birds flitting about from tree to tree. The rims above form a close horizon and are made from one of the numerous flows of basaltic lava spewed across the land nearly thirty million years ago. These flows from the north intermingled with similar flows from the San Juan Mountains to the south and pushed the Gunnison River into its current course, thus was the river trapped into the Black Canyon rather than finding an easier path elsewhere. There are a few scattered Douglas firs in the gullies where the water collects. Otherwise there are juniper and oak on the hillsides along with a few other common shrubs. Tree-going rodents abound and command the shepherds attention and area source of ceaseless fascination. I spot a deer or two crashing through the shrubs, and there are birds of prey sailing on the thermals sure to be rising from the warm slopes. This is a good place to see early season flowers but as of yet there are none. That is asking much from late March in this country. Even on this south face there are a few patches of snow along the trail where the shadows still obscure the warming influence of the sun. As I get closer to the terminus of the trail, I can see the reservoir along with the dam that causes the inundation. Just beyond the dam is the canyon that allows the Cimarron River to join the main stem. We reach the base of the trail, where the National Park Service, as part of their management of the Curecanti National Recreation Area, has established a small campground here, accessible by this trail or by boat. It is quiet and still here. I make use of one of the picnic tables and stretch out and relax as the shepherds do the same. We go explore the stony shore of the reservoir and the pups oblige themselves by leaping into the pool. More relaxation and contemplation under the small conifers as the rays of mild sunshine streak through the branches. No, I am not fond of the stagnant pool nearby but it is what it is and I feel at peace here. All too soon the moment arrives when it is time to hoist my possibles upon my shoulder and begin the upward portion of my journey. Now, the rim comes closer as each step propels me towards the trailhead atop Cimarron Point where distant views and transport await. It is now spring, and the sun is returning to its northern prominence, but the angle is still low and the light illuminates the vegetation in a manner peculiar to late March. The upward passage is smooth and my stride strong, consistent as I shortly reach the trailhead. It has been a fine day, revisiting a place last seen so long ago. I am blessed to live in this area, so much to see and do! What a change we have seen here in the Gunnison Country. The first day of spring has found the lower foothills devoid of snow, although the frozen expanses persevere at the higher elevations. The days are warm enough to melt the snow and when this freezes at night a thick crust of ice is formed. I have stopped skiing, probably until mid to late fall, and have begun to hike and explore sans skis and snowshoes. One of my first walks in the Gunnison Country this year, if not the first, I drove out west of Gunnison, Colorado, where I make my home, and parked adjacent to the locked gate at the beginning of the Rainbow Lake Road. The gates are locked to protect both wildlife habitat during the important spring months as well as to protect the road itself from the rutted abuse sure to occur were the saturated road base allowed to be driven on. The road is open to bikes, but scarce few use it. So, in some ways this area becomes a temporary de facto wilderness. I began my hike by walking up the road the first half a mile or so to the transmission lines. There is another road that I turned left, or west, on and followed until a fork occurred with yet another minor road; at this latter road, I took the right, or north, fork and followed the road up past scrub oak to its end. From there, I bushwhacked up through a small gulch and soon scrambled over a rock outcropping and found myself on top of a mesa made of basalt formed when the nearby West Elk Mountains erupted some millions of years ago. There were still patches of snow on the mesa top, but mostly it was bare to the wind. Draco and Leah enjoyed the remnant snow as they rolled around friskily. I had a strange encounter here: A hare came charging over a small rise, running at full speed straight towards us and only veered off at the last possible moment. Shortly afterwards came a coyote intent on making the hare his dinner. I could see the focus in his eyes, the forward slant of his ears as all attention was directed towards the running morsel. Naturally enough, the coyote abandoned the pursuit as soon as he spied myself and the two German shepherds. Draco eagerly began the chase when the coyote let up but the hare scampered across a patch of wet, loose snow and when Draco gave chase through the mire he floundered instantly and had to return to my side with a bit of coaxing. Here on the rim of the mesa I took some time to scope the horizon and take note of the mountains yonder. I continued to walk north until I had hiked some three or four miles distant from the highway. I was now on a ridge between East Elk and Dry Creeks. Both of these drainages pour forth their waters into Blue Mesa Reservoir, which is the inundated Gunnison River. East Elk Creek is easily the more major of the two drainages, a place where I hike frequently and I was now happy to have a chance to view this canyon from a different perspective. 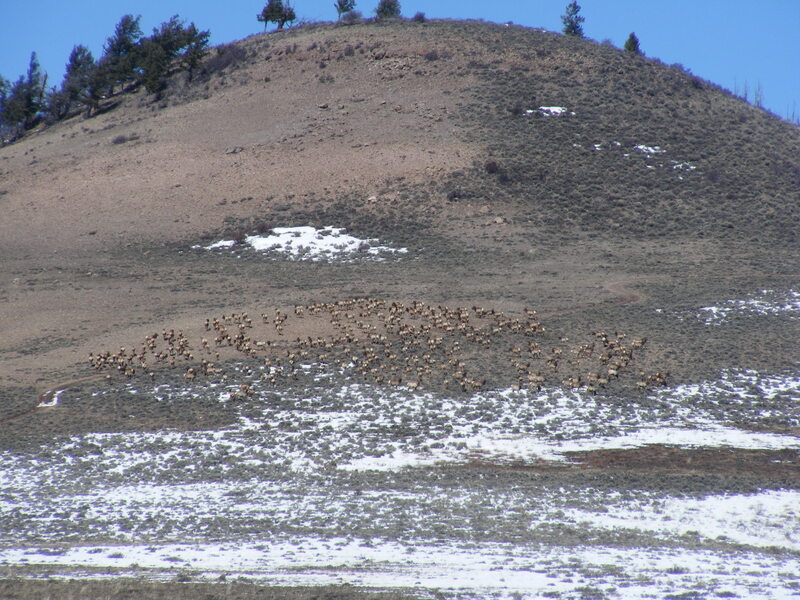 About a half a mile away I noticed that the hillside seemed to be slowly moving and using my binoculars I spotted a large herd of elk. They were slowly grazing and moving towards a higher elevation. I was glad to have stopped where I did and not push them when, during these lean months, finding food is something of a challenge. I kept track of them until they had moved up and out of sight into a small forest. Finding a dry patch of ground, I sat and gazed about the distant horizons, marveling at the change that was about to occur, from winter’s white dominance to summer’s green glory. The sun was warm and soothing despite the wind’s attempt at rapid cooling. I denoted the grass growing, yellow yet but soon to sprout forth new color. The snow remaining here wouldn’t last long on this south face. Spring! Hurrah! another winter passed! We descended through Haystack Gulch. This small drainage bisects the two larger ones and is only a mile or a mile and a half long. Once we got off the mesa the wind was not able to penetrate the lower canyon, and all was suddenly still and quiet. The canyon walls, tall, stark basalt, rise straight up. There are some aspen, choke cherry and oak that grow here, hosting a diverse array of wildlife. We walked down to the canyon mouth and then paralleled U.S. 50 through the sagebrush sea back to the waiting car. A fine first day of spring! 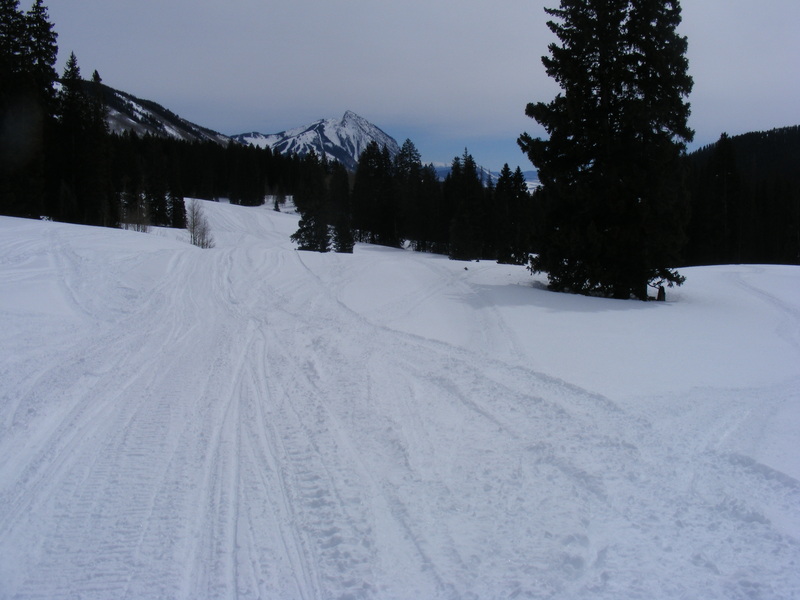 Finding places to cross-country ski in this area is something of a challenge when forming a matrix of snowpack, travel distance and avalanche avoidance. One area I don’t make enough use of is the lower, western access to Old Monarch Pass. The eastern access, just a mile or so east of Monarch Pass is a great place to get up high in the mountains and have a nice ski in the sub-alpine and alpine areas. The western access isn’t nearly so lofty, taking off from the valley formed by Tomichi Creek. To get here, I drove east out of Gunnison, Colorado on U.S. 50, past Sargents and in and out of Gunnison County, but not Country. I don’t plan to ski too far, just a couple miles up the snow-covered road that leads to the summit of the Continental Divide up above. The forest here is composed of aspen, Douglas fir and ponderosa pine. The road is winding, with switchbacks that allow views of the valley below as well as the creeks above. Here I am, in the western foothills of the Sawatch Range, barely aware of the high peaks above surrounded as I am by montane forest. Major Creek is the drainage to the south, and gazing up its length I am treated to a view of hill after hill of forest enshrouded landscape that eventually becomes hidden in a low hanging mist. To the north are occasional view of No Name Creek, the summits of which are similarly obscured by the gray clouds. Both of these drainages carry off water from a small portion of the Great Divide on its long journey to the sea. The snow is beginning to stiffen and become icy in the morning. By the afternoon the snow is softening enough that finding a firm base is a challenge. I must be careful not to stay out too long else I will have a long, plodding return that would be more of a challenge that I would wish for. But having not gone far, I don’t worry too much. I have found a nice meadow on a south face that allows the feeble sun to provide a smidgen of warmth. 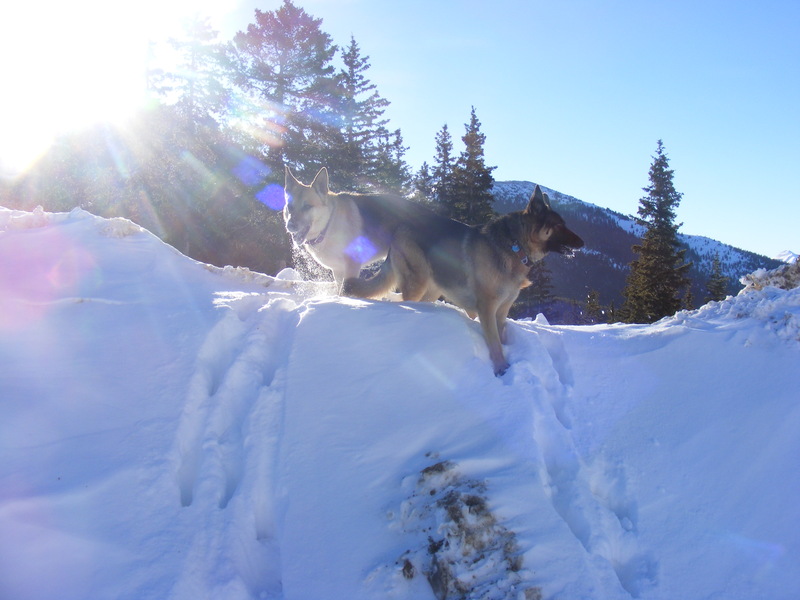 The snow is deep and the dogs flounder a bit, but find enough hard-packed snow to stay afloat on the surface. We rest and admire the view. The clouds are sailing by, threatening in disposition, but not actually precipitating moisture. This area is quiet, and I feel the serenity of reposing in the bosom of the mountains. I wish to stay, but must return soon. The nights remain well below freezing and the morning are correspondingly cold. However, now with the sun returning from its southern sojourn, the afternoons are beginning to become warm, even on these cloudy days that hide the sun. Soon this snow will be naught but a memory whose legacy shall live on in the green vegetation and flowing creeks. The mountains’ composure, so calm from a distance, actually belied a ferocious temper of wind and snow. Staying in the trees, most of the wind gusted harmlessly above me. I was happy to be were I was and then happy to return home to let the storm pass. Long my I hike and ski! This area is pretty and in the summer is a wildflower wonderland. Now, towards the end of winter, the snow covers the land and when it melts the water will soak into the soil and help bring forth summer’s blooms. The gulch is long, and the meadow is interspersed with copse of conifer. Gothic Mountain towers over and the rocky pinnacle sits high, clad in snow, sharp knife-like ridges of gray rock, mighty intrusion of molten rock now cooled and slowly being eroded into sand, the fate of all mountains. Crested Butte lies down towards the gulch’s outlet into the Slate River and shares similar characteristics to Gothic Mountain but is now adorning ski runs on the north face. Whetstone Mountain sits on the opposite side of the Town of Crested Butte, and forms some of the horizon to my south. There are others out of sight, and they all share similar geology, laccoliths all. A fascinating area, geologically. Eventually I come to an area that has characteristics of avalanche potential and stop. I employ and overabundance of caution when it comes to sliding snow, and considering that I am alone, I decide to turn around and call it a day. 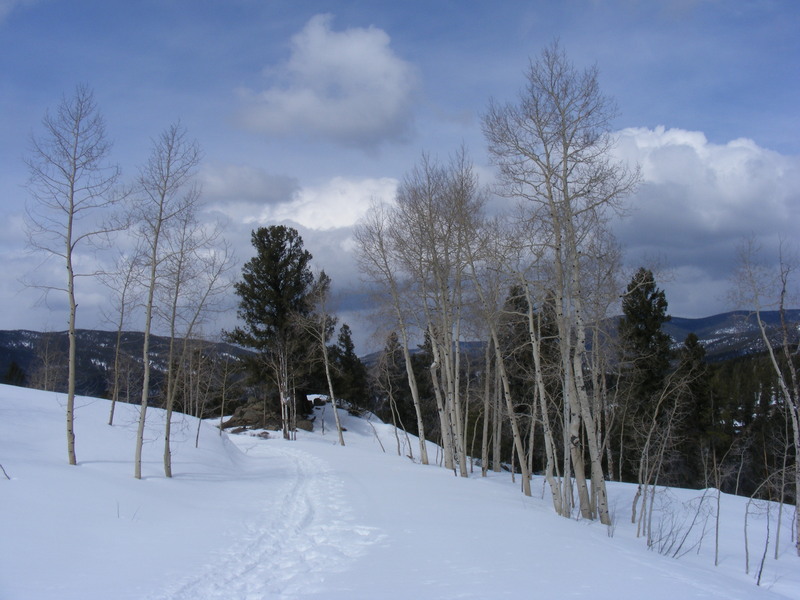 The ski back is uneventful, passing bare aspen, the trunks of which are a shade of white a touch greener than the surrounding snow. Yet, signs of life are evident to the observant. The branches and twigs on the aspen are beginning to swell with sap and the buds are enlarged as well. Spring is less than two weeks away, and Mother Nature knows it. It has been a quick day, enlivened by seeing friends at the trailhead before I had set out. I am happy to have gotten to see some mountains and stand in their presence. The snow is deep, a good sign of the coming abundance. It had been many years since I had previously skied this area and I was glad to have returned to this small corner of the Rocky Mountains. After all the stormy weather, this third day of glorious sunshine filled me with a wanderlust that could only be abated with a crossing of the Great Divide that would facilitate an exploration of the Arkansas River, Current Creek and the southern portions of South Park. I was curious as to the amount of snow on the eastern slopes of the Continental Divide and wanted to revisit some country that I have been known to wander over in previous days. Naturally enough, the day was begun with a drive east on U.S. 50 out of Gunnison, Colorado, up to the summit of Monarch Pass. This was the first scheduled stop of the day, a customary place to pull over and let the shepherds stretch their legs. The snowbanks where high and I enjoyed the usual views of Agate Creek and the South Arkansas River. Draco and Leah thrilled themselves with leaping pounces through the deep snow and elevating themselves to the tops of the piled-high banks of snow. We continued driving eastbound on U.S. 50 to Salida and Bighorn Sheep Canyon beyond. At Texas Creek we stopped again on the opposite bank of Texas Creek Gulch and climbed the most immediate high point, an eminence some six or seven feet above the Arkansas River. Here, I could see a portion of the Sangre de Cristo Mountains and the Sawatch Range. These two long ranges were snow-capped and glistened off the shining sun. Not a cloud in the sky, so any white I was seeing was the snow clinging to those high slopes. More immediately in my vicinity were the rocky mounds of the McIntyre Hills, made from the same granite that surrounds this canyon. This country is rugged, made from narrow canyons, steep, rocky walls and thick copses of thorny brush. Additionally, Texas Creek pours out of a defile through this same granitic rock, draining from the far slopes of the Sangre de Cristo Mountains. As it turns out, there wasn’t much snow laying about this low country. Most of it, especially on the south faces, has melted off completely and left bare, dry ground. We descend, avoiding the cactus, and continue to Canon City where we visit a site north of town that in general contains many fossilized remains of dinosaurs. This area was a hot spot for prehistoric discoveries during the late nineteenth century and still yields an occasional interesting find. However, there was enough snow to have made the area muddy and difficult to walk in so we didn’t stay long before another quick visit to Newlin Creek south of Florence where the same conditions were found. The snow seemed to lessen around Salida but then picked up some towards the plains. We returned to Canon City and then took Colorado State Highway 9 that followed Current Creek and runs over the pass of the same name before descending into the southern part of South Park near the Thirty-Nine Mile Mountains. I love this drive and find solace in the wide open landscape. At Hartsel, we followed U.S. 24 west to Johnson Village and the Arkansas River before returning to Gunnison via U.S. 285 that parallels the Sawatch Range and then U.S. 50 up and over Monarch Pass again. Before reaching Johnson Village we stopped one, last time along Trout Creek to climb a small hill and look at The Castles. It turned out to be a long day, but it was great to visit some of the surrounding country and see new places and revisit old ones.